Our latest Goodreads Giveaway has started! Enter today to win an autographed print copy of the new Michael Quinn short story Paradise. ‘On a rainy night, traveling along a desolate stretch of the California coast, Michael Quinn pulls his motorcycle off the highway and checks into a roadside inn. Hurry–this Giveaway for this action-packed thriller ends soon! Go to www.goodreads.com, click on Giveaways, and enter the contest to win a copy of Paradise. On a rainy night, traveling along a desolate stretch of the California Coast, Michael Quinn pulls his motorcycle off the highway and checks into a roadside inn. An unforgettable evening awaits him…if he lives through it. Much of the modern world, the world that dominates our nightly news, arose from the ashes of a war that ended a century ago. For a captivating summer read, Norman Stone’s World War One, A Short History (Basic Books, 2009, 226 pp.) will time and again leave the reader thinking, “So that’s how things came to be.” Written like a novel, the events flow fast and furious, as the great empires of the day are pulled into a conflict whose resolutions still dominate the globe. At a time of global disarray, perspective can be gained from this biography of a man who helped save the world when it truly was ablaze. Most Americans only know Winston Churchill as the cigar-chomping Prime Minister whose brilliant leadership of England led to Allied victory in World War II. In Paul Johnson’s Churchill we get to know a man who, in addition to preserving “freedom and democracy and the values we hold dear in the West,” accomplished much more in his long life. Enter Today to Win A Copy of The Third Man! Our latest Goodreads Giveaway has started! Enter today for an opportunity to win an autographed print copy of the new Michael Quinn short story The Third Man. Giveaway ends January 24, 2017. 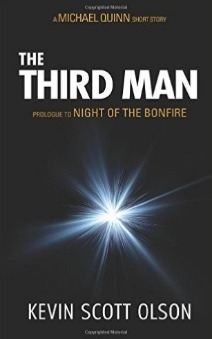 Enter today to win a copy of the latest Michael Quinn short story THE THIRD MAN! If a summer movie about a brave surfer girl battling the cruel side of Nature sounds appealing, check out The Shallows. Night of the Bonfire is Now an Amazon Best Seller! Breaks Into the Top Ten! Purchase your copy of the best-selling Michael Quinn debut novel Night of the Bonfire here!